Want to know about cardamom essential oil? 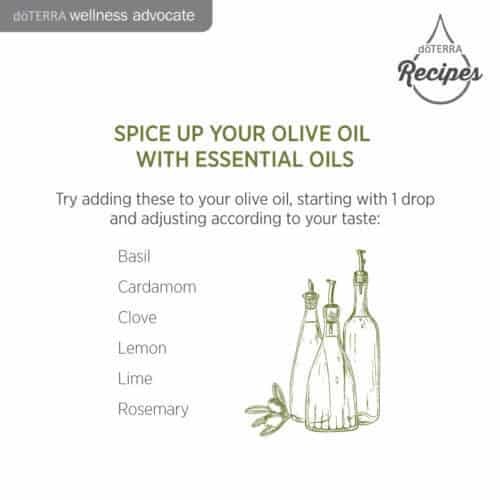 I have included all there is to know about doTERRA cardamom essential oil uses including Diffuser & food recipes. Known as the “queen of spices” in the cooking world, cardamom is a popular spice used around the globe in a variety of dishes. While cardamom is a flavorful, distinctive spice, the essential oil that comes from cardamom seeds has uses that reach far beyond the kitchen. With calming and soothing properties, Cardamom can ease digestion,* promote feelings of clear breathing,* alleviate stomach discomfort,* and more. The chemical makeup of Cardamom makes it a calming oil—allowing it to provide soothing effects for the digestive system when ingested. 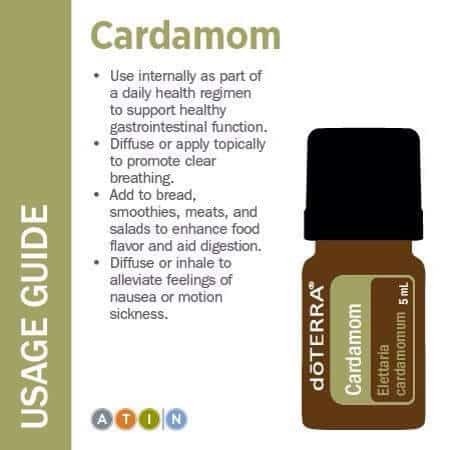 Cardamom oil can be used to slow down muscle contractions in the intestines and to ease bowel looseness,* which is why it is commonly taken to aid in digestion. * Consider taking Cardamom oil internally when experiencing occasional feelings of stomach discomfort, or after over-indulging at dinner. 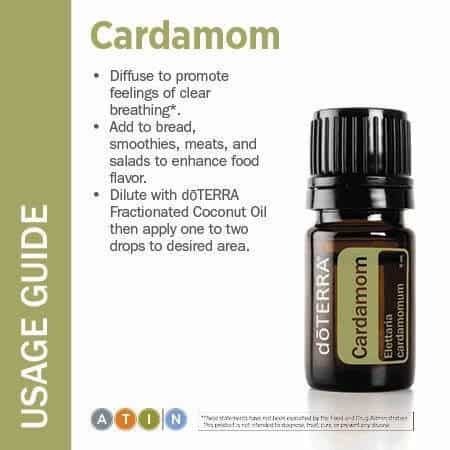 * When taken internally, it is best to dilute one drop of Cardamom oil in 4 oz. of liquid. Just as Cardamom oil can be used to calm the digestive system, its aroma can also be calming and soothing. 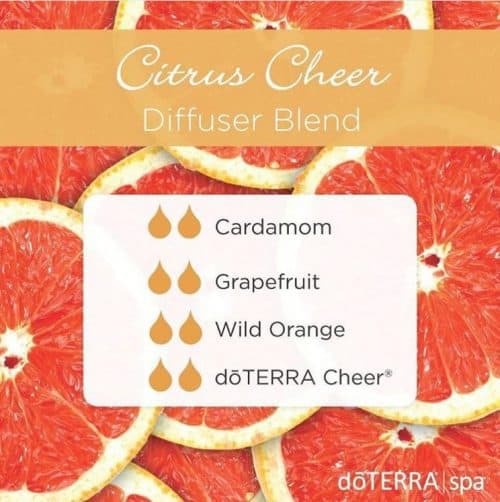 When using Cardamom to promote a sense of openness or feelings of mental clarity, consider diffusing the oil in the essential oil diffuser of your choice. Diffusing Cardamom oil helps promote a sense of a clear head, offering an overall soothing and calming feeling. 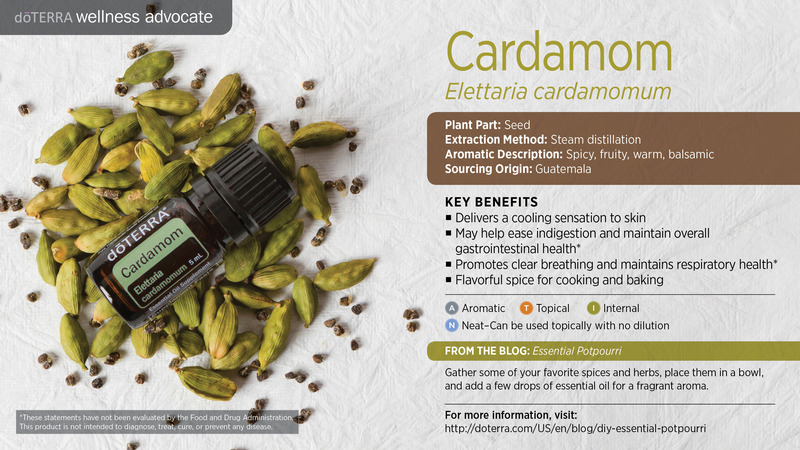 The calming and soothing properties of Cardamom can also be experienced when used topically. When you want to soothe or cool your skin, apply Cardamom oil on the skin for a cooling, refreshing sensation. 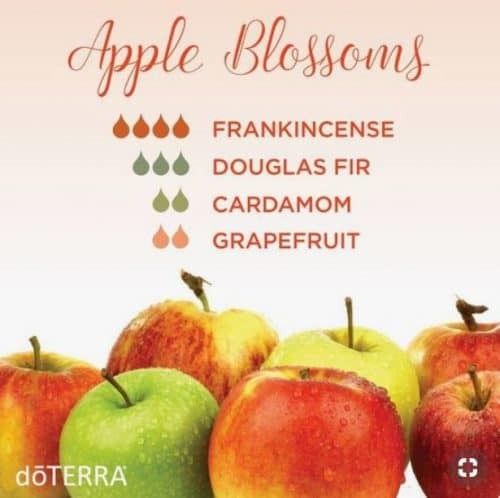 Remember, when applying Cardamom to the skin, apply one or two drops to the area and dilute the oil with doTERRA Fractionated Coconut Oil to help avoid skin irritation or sensitivity. 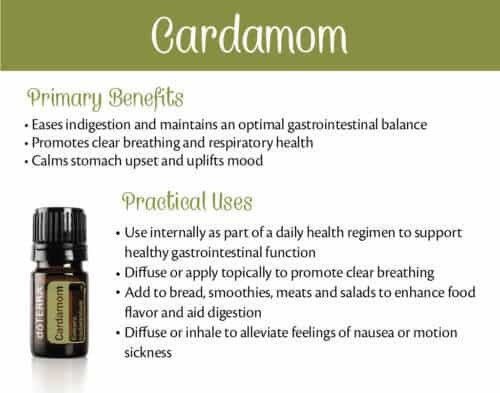 Another internal benefit of Cardamom is its ability to promote clear airways and breathing and aid in respiratory health. 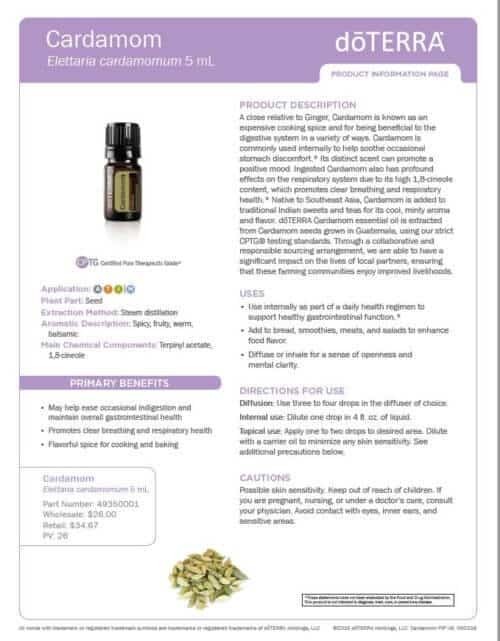 * It is a key ingredient in the doTERRA Breathe Respiratory Blend and Respiratory Drops. Cardamom has a unique, pungent aroma that makes it useful around the home when you want an inviting, warm scent to fill the room. Cardamom oil’s spicy, warm, balsamic aroma is the perfect addition to any cozy home—particularly in the fall and winter. If you want to spread the unique fragrance of Cardamom around your own home, try making your own potpourri with Cardamom oil. You can place it anywhere you want a spicy and warm aroma. Looking for a way to use Cardamom in the kitchen? This Cardamom recipe with molasses and oatmeal will be your new favorite once you give it a try. 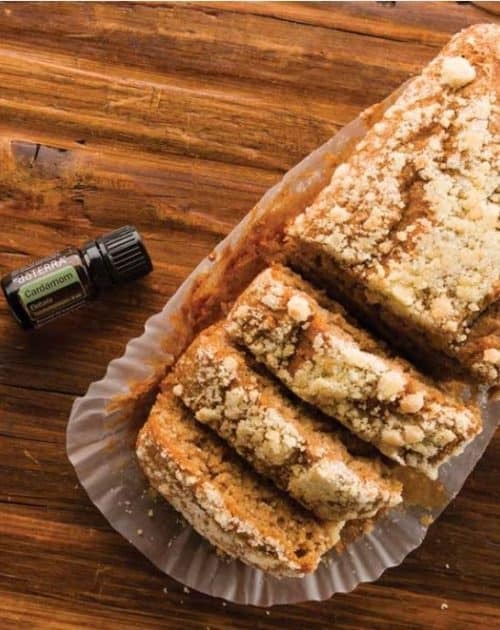 Visit the blog to learn how to make these delicious Hearty Cardamom Oatmeal-Molasses Rolls with doTERRA Cardamom, and add a new recipe to your book. 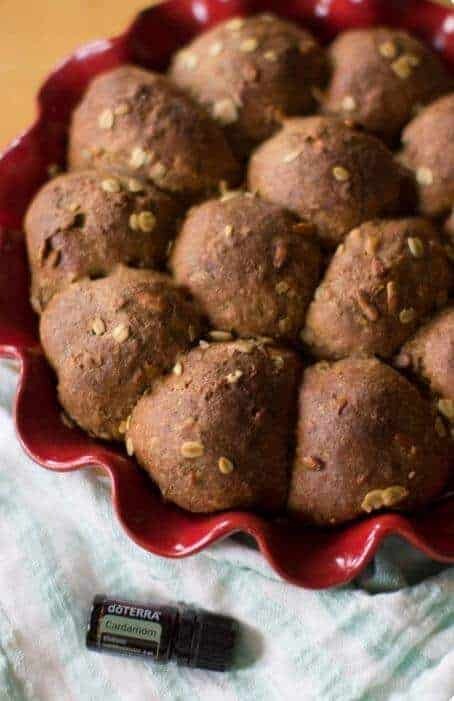 I just used this in my apple cardamom scones and they are delicious!